All cities revolve around taking your money — Vegas is just the most up-front about it. Still, there are a surprising number of awesome things you can do and see here for free. While Vegas might not be the ideal city to visit on a budget, you can certainly take what you save in entertainment and funnel it towards…more entertainment! There are three of these signs that you can find around the Las Vegas Valley, but two are replicas. 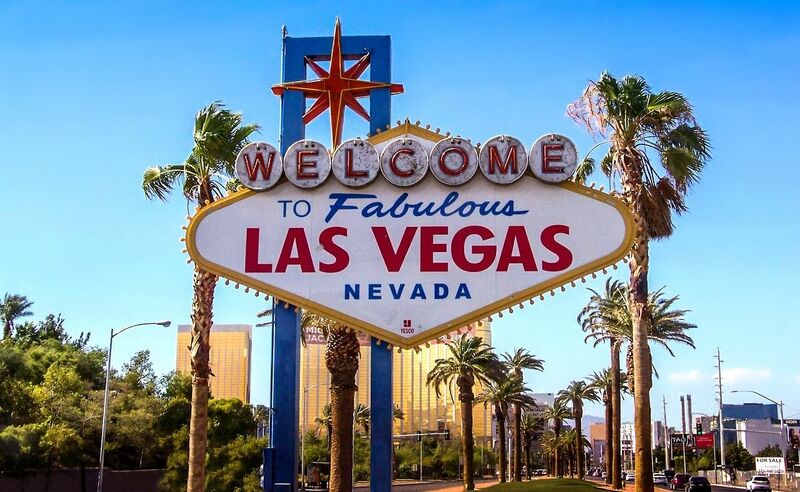 The original Welcome to Fabulous Las Vegas sign is the one at 5100 Las Vegas Boulevard South — and it is on the National Register of Historic Places. It’s also solar-powered. The Bellagio Fountains may be the most iconic sight in all of Las Vegas (and one of the most-Instagrammed attractions in the world), and really a must-see when you’re in town. The dancing fountains are choreographed to the music of Vegas greats like Tony Bennett, Celine Dion, and…DJ Tiesto. 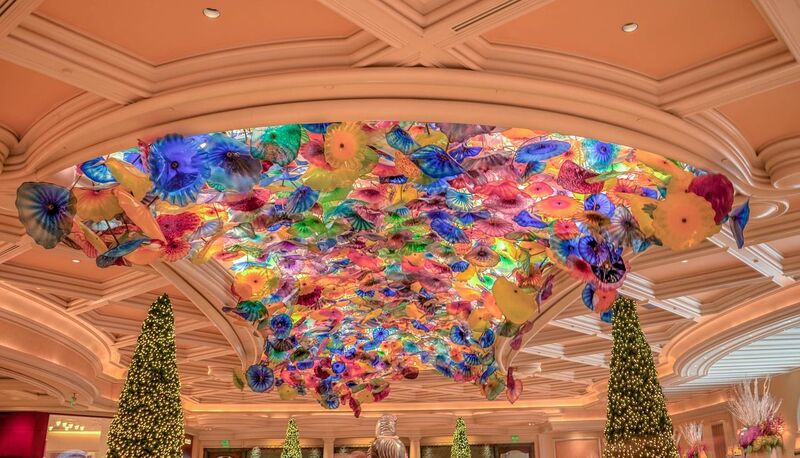 The hotel/casino lobby features a ceiling covered in 2,000 Dale Chihuly-crafted glass flower, and just past the lobby is the 14,000-square-foot conservatory that displays more than 10,000 fresh flowers updated each season. And, while the show itself certainly isn’t free, the “O” by Cirque du Soleil theatre lobby is a gallery of its own, with more than 50 bronze sculptures, original drawings, and lithographs from the show. 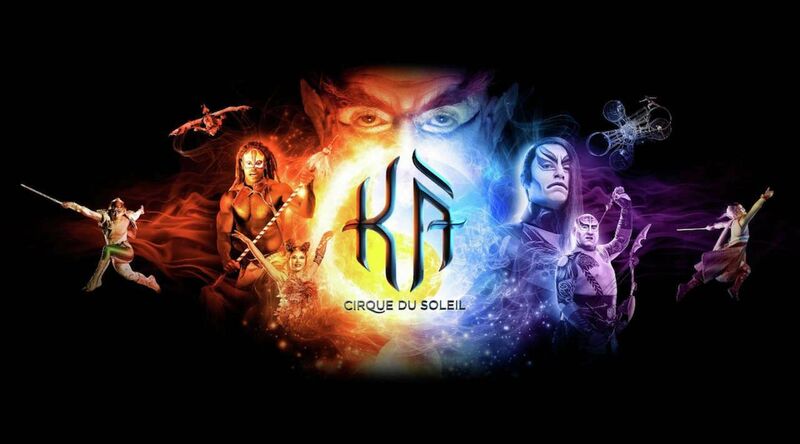 You can get a free behind-the-scenes look at the $165-million production of Cirque du Soleil show Ká Cirque Du Soleil at the MGM Grand. It’s every Tuesday at 11:00 AM and 11:30 AM and Saturday at 12:00 PM and 12:30 PM, and there are no reservations required. Another free thing to do at the MGM: be part of a focus group audience viewing unaired pilot episodes of new CBS shows in consideration, at the Television City Research facility. This site is located past the food court. You’ll also get free gifts for participating and might even get paid cash. There is absolutely no pretence here. Vegas is all about flashing money around, and for those who don’t have piles of it to spare, sometimes the fun is in watching others do it. Or taking selfies with actual piles of money, as you can do at Binion’s Gambling Hall downtown, where they have a million dollars stacked in a pyramid on display. 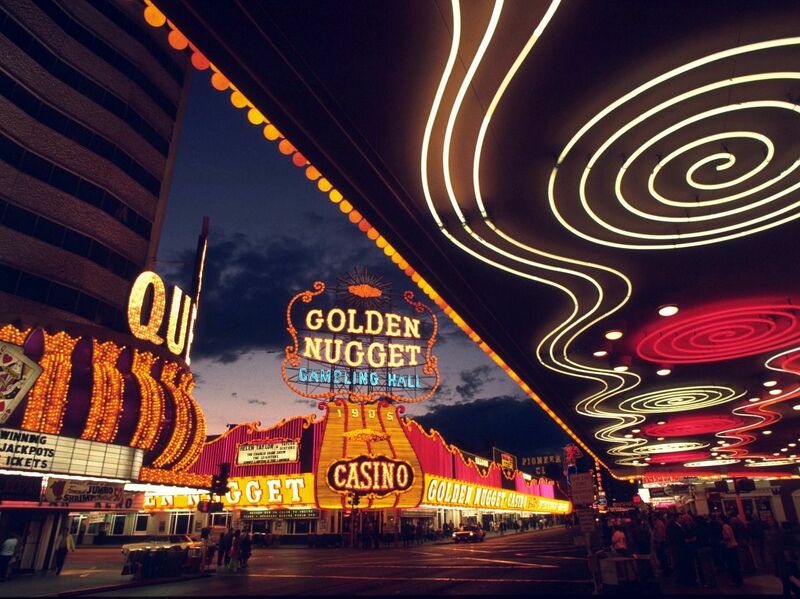 There is also the Hand of Faith at the Golden Nugget Casino (also located downtown), a huge gold nugget that is the largest in the world at 61 pounds. The Cosmopolitan’s three-story Chandelier Bar featuring 2 million beaded crystals — and the murals in its parking garage (the work of some of the biggest names in street art, like Shepard Fairey) are free to check out and not to be missed. The property is also known for its extensive art collection. The newest work is an installation that looks like a mural but is actually constructed of 3,000 plastic room key cards from the Cosmo. That’s not a misprint, a nickname, or a euphemism for some cerebral piece of contemporary concept art: there is a $28-million, 2,000-pound statue of Popeye the Sailor by artist Jeff Koons in the Wynn Esplanade. If you want to see it in Vegas, you need to act fast: the statue is scheduled to be relocated to Wynn’s new resort, Wynn Boston Harbor, opening in Everett, Massachusetts in 2019. You don’t have to be in town during the Life is Beautiful festival (or pay the exorbitant prices for the increasingly Coachella-esque lineup) to enjoy the ever-expanding open-air art gallery that the festival is responsible for creating downtown. 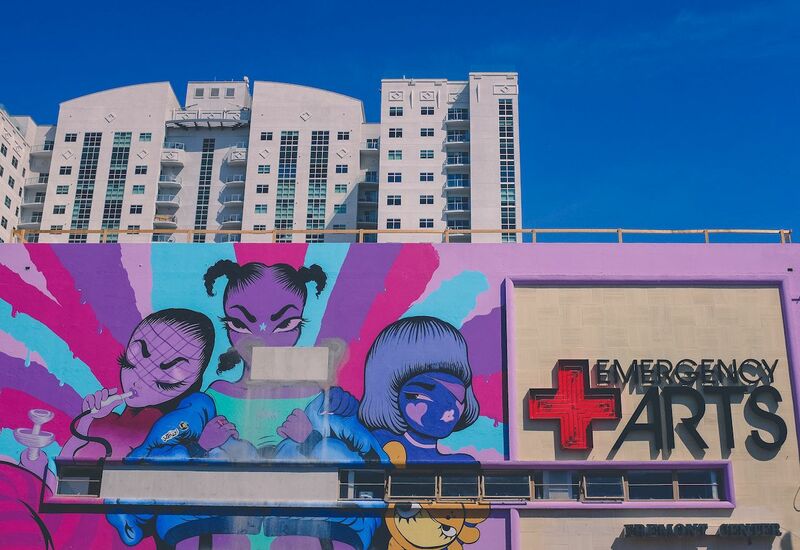 Murals from some of the biggest names in street art in the world cover DTLV, with more made each September, thanks to the festival’s street art program. You can experience a little bit of Burning Man all year long with the 40-foot sculpture Bliss Dance located in the outdoor dining and entertainment district, The Park, sandwiched between New York New York and the Monte Carlo (soon to be The Park MGM and NoMad Hotel). 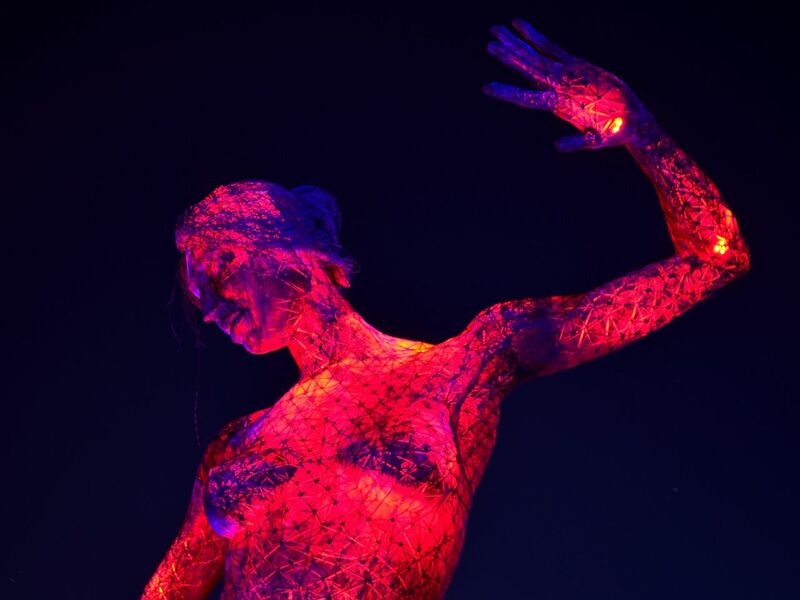 The statue was inspired by artist Marco Cochrane’s first trip to Burning Man and later debuted at the festival held annually in Nevada’s Black Rock Desert. 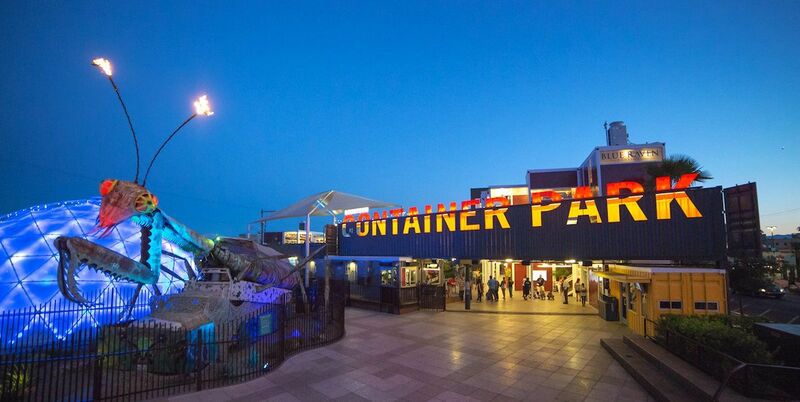 Another remnant of Burning Man’s past — a 40-foot-long recycled metal praying mantis sculpture which shoots fire, guards the entrance to the Downtown Container Park, scaring passers-by. It burns through 50 gallons of propane each night shooting flames that can reach six stories high. 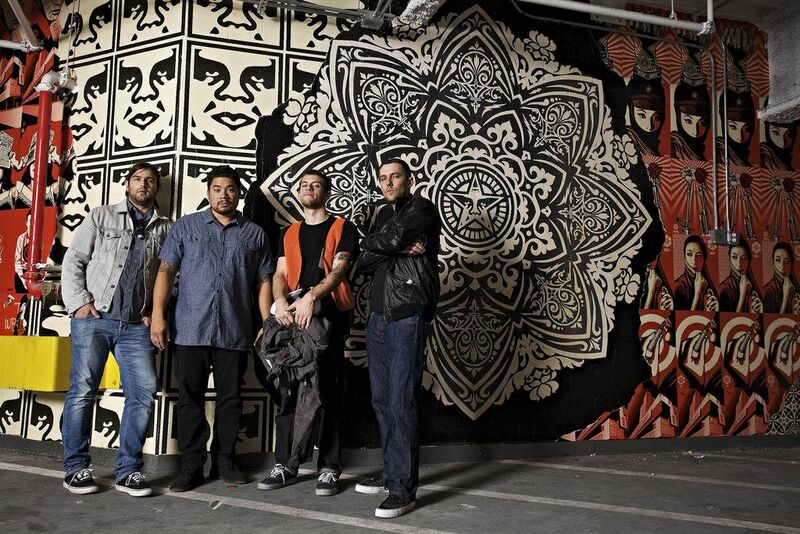 An event that has been going on since 2002, First Friday is held in the 18b Arts District of downtown Las Vegas the first Friday of every month, with artists’ booths filling the streets, galleries and artist spaces opening to the public, live music on outdoor stages, and a variety of food trucks to serve the tens of thousands of people who turn out each month. 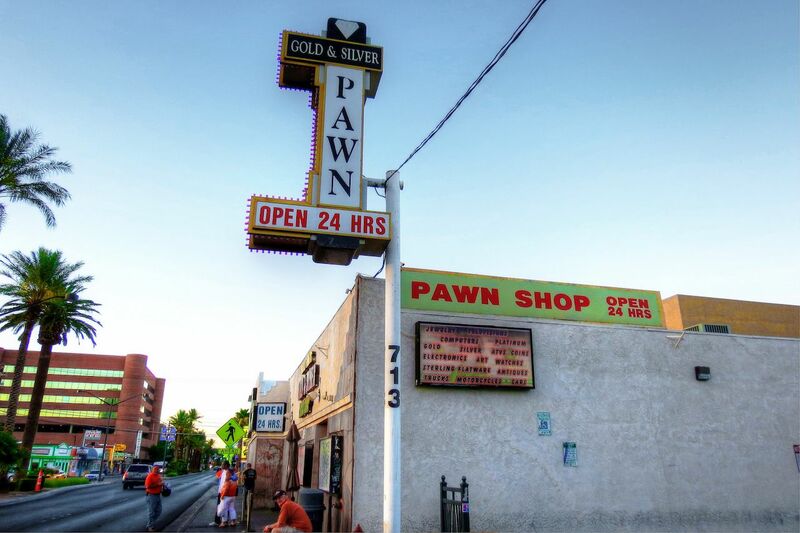 For reality television celebrity gawkers, you can visit the pawnshop where Pawn Stars is filmed, then grab a bite at Pawn Plaza, the shipping container shopping center owned by Rick Harrison next to the store. Men can pee on an actual piece of the Berlin Wall in a men’s room inside the Main Street Station Casino. We won’t say any more about that. 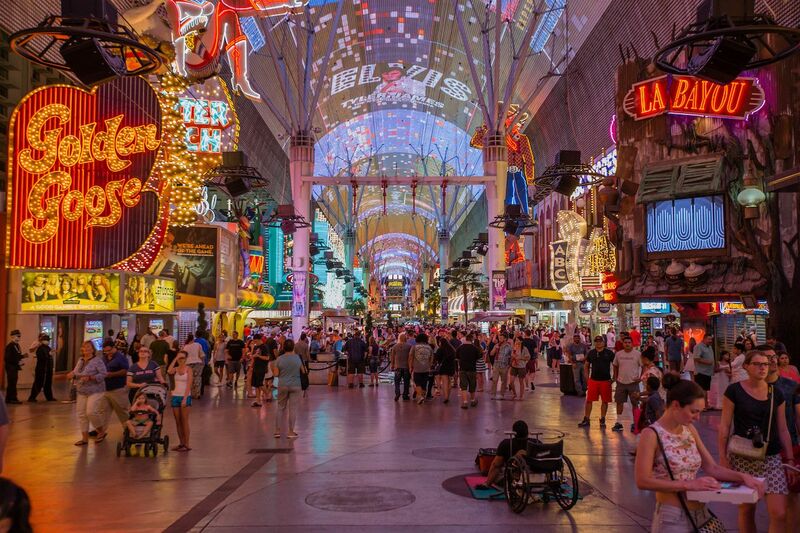 While everything in the Fremont Street will cost you money, including taking selfies with the many costumed “performers” (really just people who have purchased licenses to wear costumes to stand on designated spots on Fremont and pose for pictures in and take your money) — the actual “experience” of the downtown pedestrian mall itself is free. So is the Viva Vision light show — played on the 1,500-foot LED canopy 90 feet above the crowds’ heads and set to music from bands ranging from Bon Jovi to Linkin Park — as well as the many cover bands and a whole lot of ’80s and ’90s has-been bands that play on the three different stages each night. 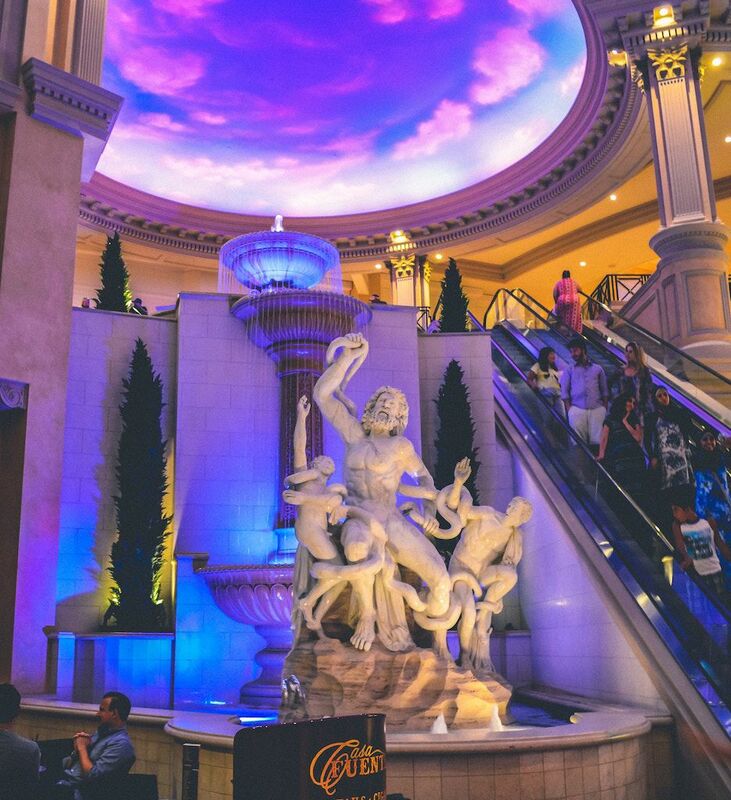 The newly revamped Fall of Atlantis show inside the Forum Shops at Caesars Palace is an old show given a bit of a new life. 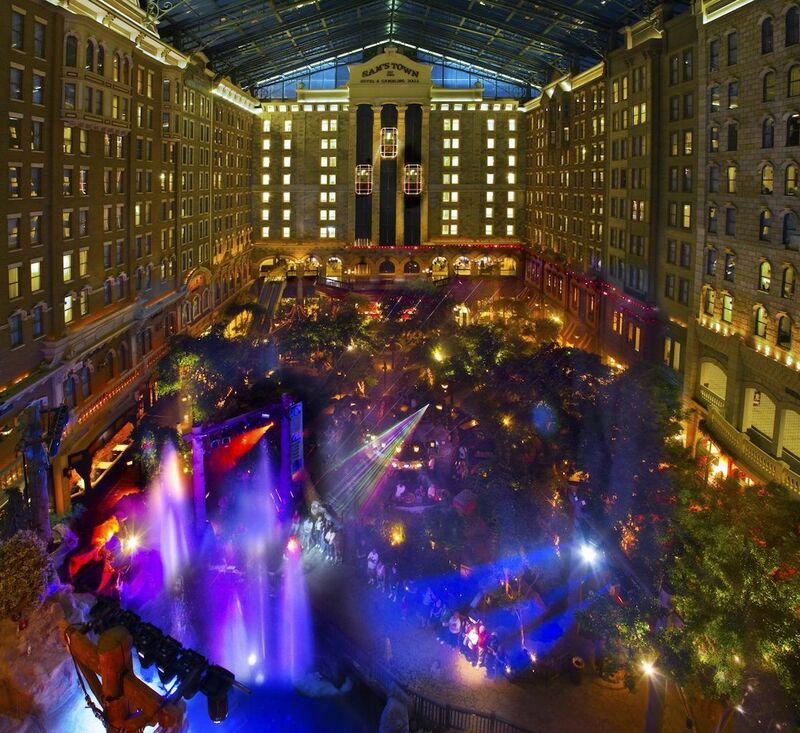 It features lots of fire and water, as well as nine-foot-tall animatronic talking statues. There is also a 50,000-gallon saltwater aquarium nearby with more than 300 fish for even more free supersized Vegas entertainment. 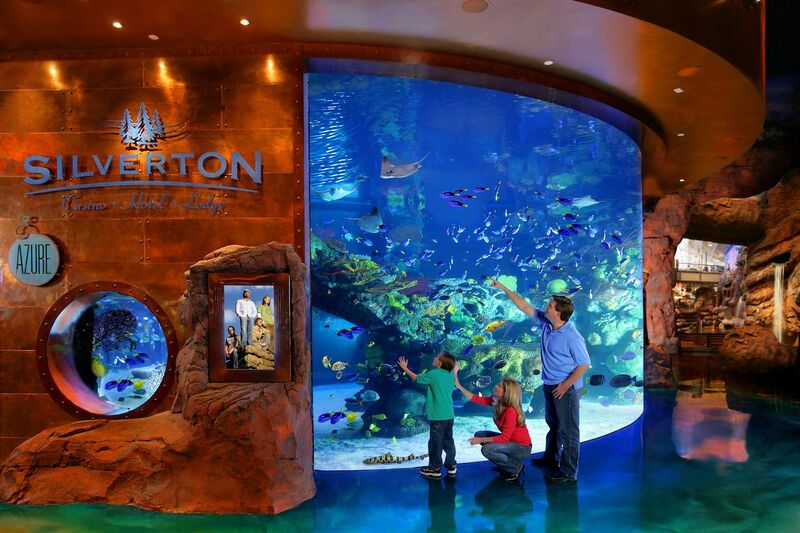 Because bigger is better in Vegas, the aquarium at the Silverton Casino holds 117,000 gallons of water and thousands of tropical fish, including stingrays and sharks, with two additional 500-gallon aquarium filled with jellyfish and lit with LED lights above the Mermaid Bar. There are also mermaids swimming around Thursdays through Sundays, and live stingray feedings during which the staff marine biologist answers guests’ questions. And next door to the main aquarium is the 18,000-gallon water feature at the Bass Pro Shop simulating Red Rock Canyon and filled with live koi fish. 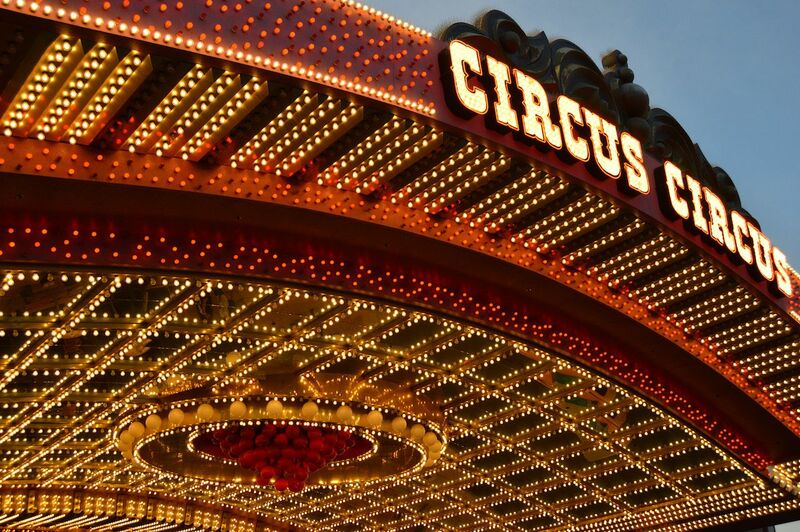 The days of the Hunter S. Thompson’s revolving midway bar are long gone, but the high-flying acrobats performing above the Carnival Midway can still be seen daily at Circus Circus. 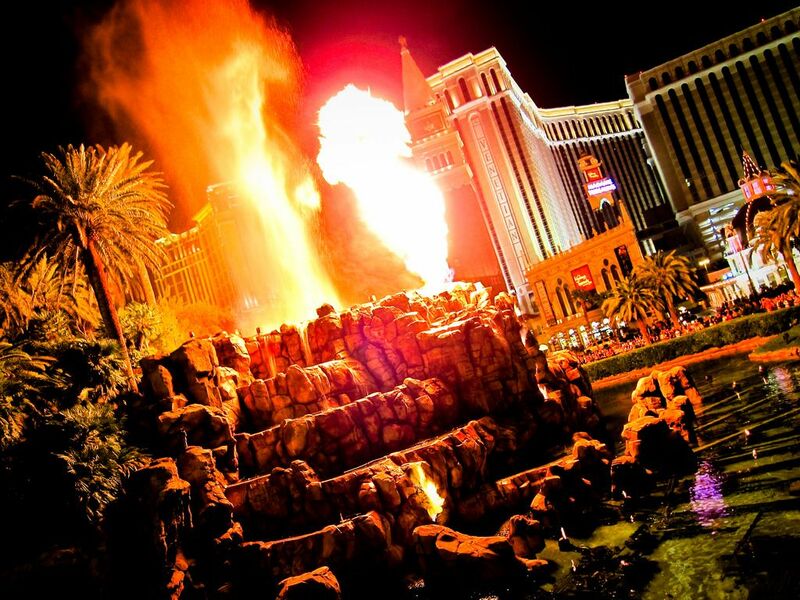 The Strip-side fire-spewing volcano at the Mirage has long been a Vegas favorite, and still erupts nightly at 8 PM and 9 PM, and 10 PM Fridays and Saturdays. 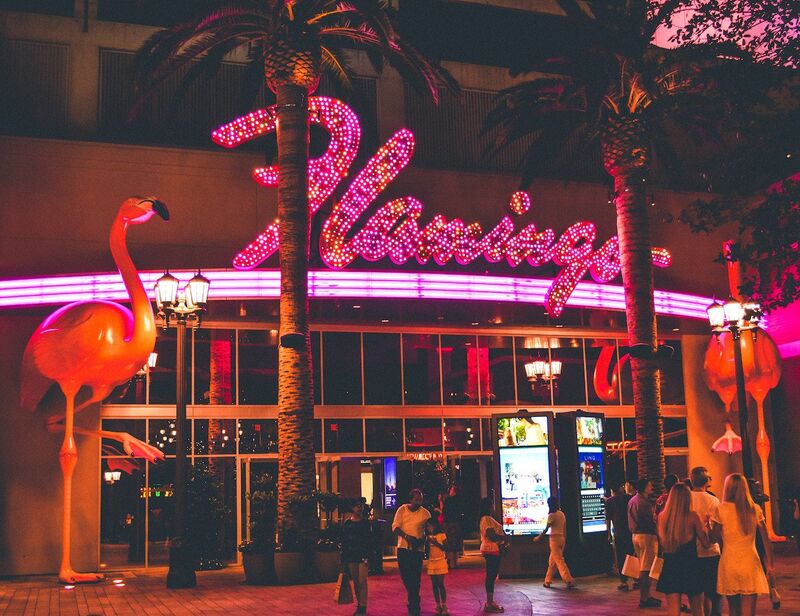 The 15-acre Flamingo Wildlife Habitat is tucked away between the Flamingo Hotel’s casino floor and outdoor pools. Here you can view a variety of exotic birds, fish, and turtles including, naturally, Chilean flamingos. The Lake of Dreams with its 40-foot-tall waterfall can be seen from many popular lounges and restaurants at the Wynn, so be sure to snag a terrace table at one of them. 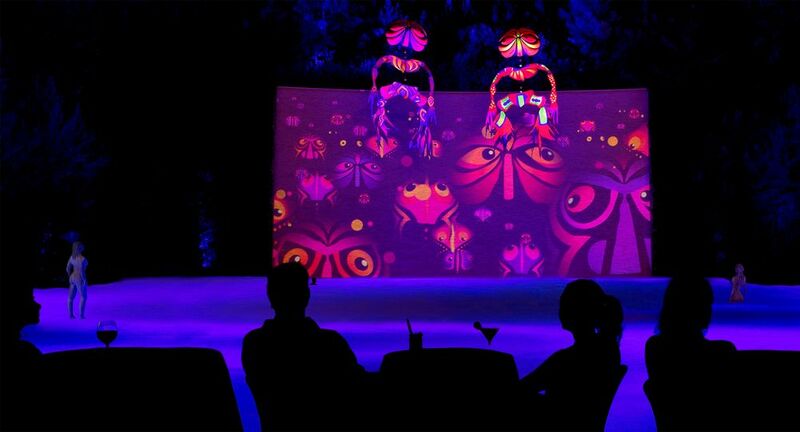 At night, the lake comes alive with 4,000 lights, holographic images, and puppetry. Las Vegas’s own local chocolatier, Ethel M Chocolates, offers free tours at its factory in the suburb of Henderson, less than 20 minutes from the Strip. The factory is also home to a botanical cactus garden, with over 300 different species of plants. It is one of the largest collections of its kind in the world. Even better: starting in November, the cacti are strung with half a million Christmas lights. Sam’s Town is on Boulder Highway, and while it might not strike you as much from the outside, inside is home to a lovely atrium with rolling faux waterfalls and animatronic animals. The Sunset Stampede Laser Light Show happens here daily every two hours, starting at 2 PM and running until 10 PM, but the best time to come is Christmastime when the atrium is strung with Christmas lights and décor. If you want some real outdoors instead of indoor facsimiles, Vegas has plenty. 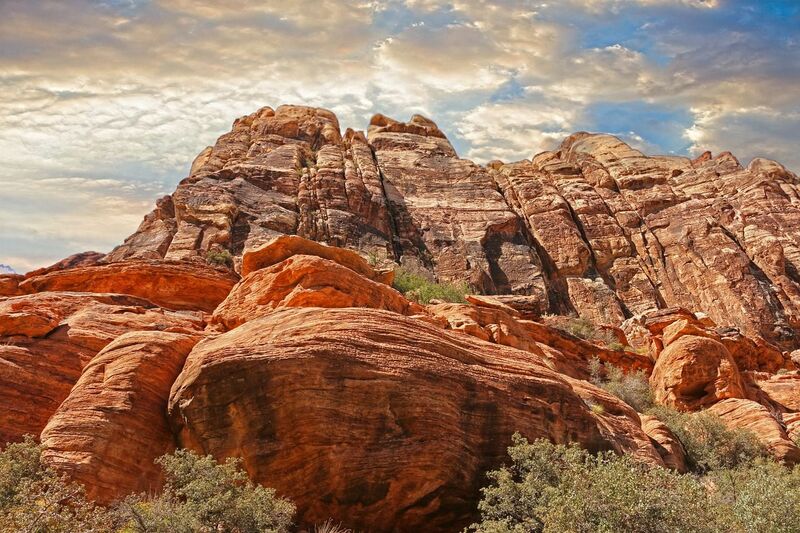 What was once a Vegas best-kept secret is now very much out: the gorgeous landscape of Red Rock Canyon National Conservation Area . While not every person will be up for the aggressive and strenuous technical hiking and climbing routes, there are also plenty of easy scenic hikes even novices (and dogs and kids) can do that can be accessed outside the park’s pay area. But really, spend the extra few bucks to support our national parks and at least drive the 13-mile scenic loop, making a few of the designated stops for photos along the way. This is a public park designed to show desert dwellers that they don’t have to defy nature and try to force grass to grow in yards which can be just as beautiful without wasting endless gallons of precious water. 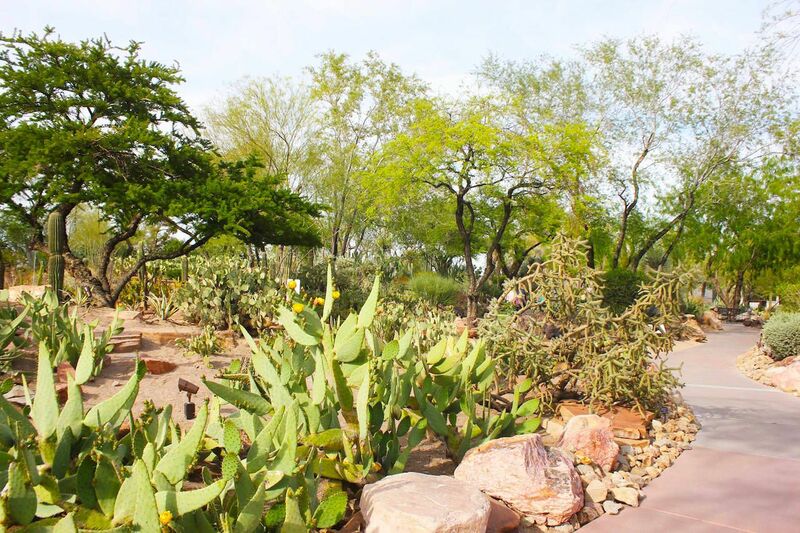 The Acacia Demonstration Gardens in Henderson are a showcase of landscaping in a dry desert climate. 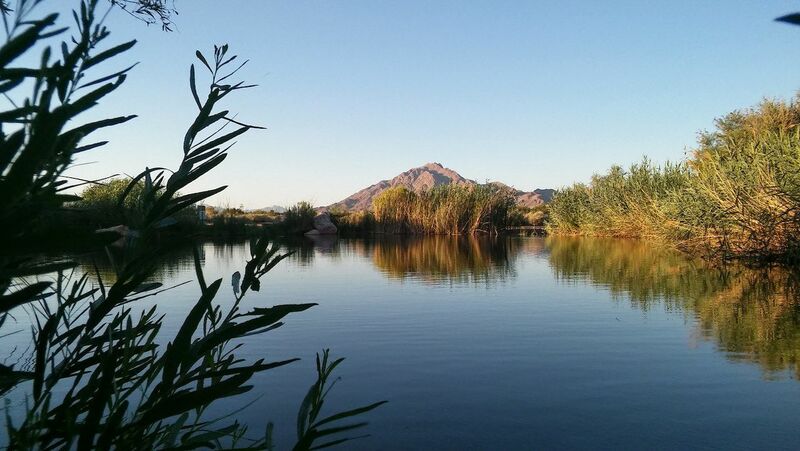 Sunset Park has nine softball fields, two Little League fields, eight basketball courts, five playgrounds, seven sand volleyball courts, eight tennis courts, a large pond that attracts all variety of waterfowl, many picnic areas, miles and miles of paved walking paths, and additional areas of undeveloped ancient dunes — the last remaining dunes of what once covered all of Paradise Valley. 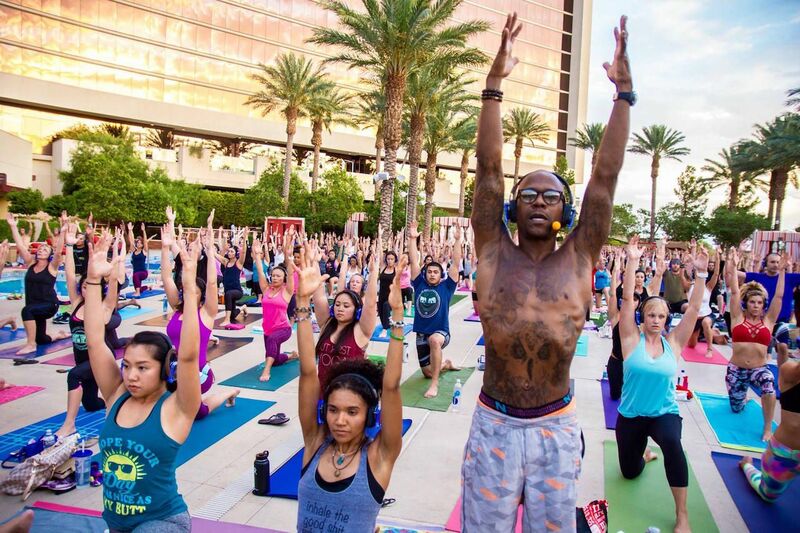 Outdoor yoga done only as Vegas could, weekly Silent Savasana events are held all over Las Vegas, including at the Red Rock Resort and Green Valley Ranch, where participants wear state-of-the-art LED headsets and do their poses out by the sprawling pool complexes. 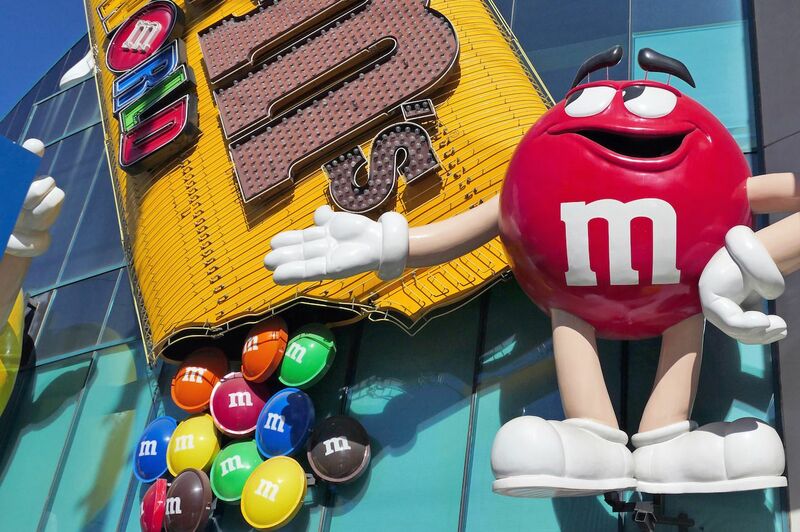 While these are separate attractions, they are located across the Strip from each other and each are multi-level venues themed around chocolate, with an 800-pound Statue of Liberty (at Hershey’s World, located in New York New York) and 3D movies (featuring the charismatic Red and Yellow M&M’s) in M&M’s World. If you’re gonna hit one you might as well cross the Strip and hit the other. Contrary to lore, you don’t have to gamble to get free booze in Vegas; you just have to be on the right mailing lists. Check out Cocktail City Vegas and Rock ‘n Roll Wine for starters. Events not only include select free drinks during a limited timeframe but also often promote discounted concert tickets and free club entry. Also, Bound Bar Las Vegas at the Cromwell Hotel hosts a free “mixology hour” every Friday and Saturday at 5 PM when hotel guests can learn how to make signature cocktails and enjoy complimentary samples from the bar’s cocktail menu.